It is probably back to school time if you are on this page. 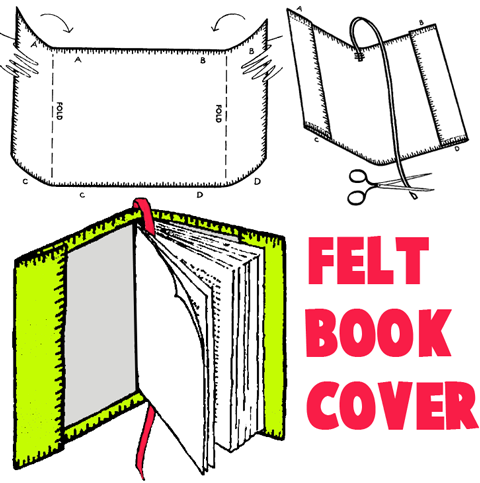 Covering your books is a great way to protect your school textbooks...and most teachers require book covers within the first few weeks of school. Folding a brown paper grocery bag into a usable book cover is really easy...one you get the hang of it. Here you will find out how to make school book covers and how to decorate them with decoration crafts projects and activities for kids. There are many other ways that you can design a great book cover...use your imagination and lets see what you come up with. Make cool hand decorated book covers crafts with ripped magazines and newspaper pictures these instructions found below. Nice looking book covers can be made from anything...jeans, fabric, brown paper bags, newspapers, comics, gift bags, wrapping paper, etc. See the above diagrams for directions. 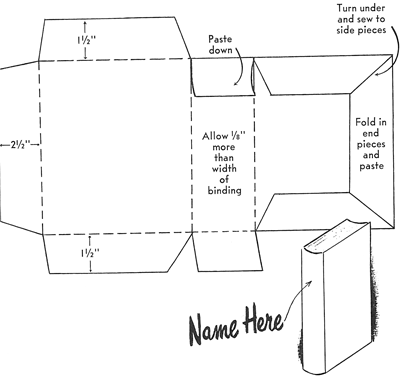 To make these book covers follow carefully directions given with the pattern shown on this page. It is a nice toch to to put the name of the book on its new cover. Measure the book that you want to cover...then cut a piece of felt, leather, or plastic that will fit around your book plus an extra 1/2 inche on each side of the book. Now use the same material to cut 2 flaps that are about 2 1/2 inches wide and the same height as the book that you are covering. Now lay the cover out flat, with the wrong side of the fabric facing up and then clip flaps at each end of the cover with paper clips as seen in the picture above. Now use an awl or punch to punch holes all around the edge of the cover ... each about 1/2 inch apart (about 1/4 inch from the edge). Make the first 2 holes at each corner only 1/4 inch apart...see sketch above. Now start lacing at the center bottom and lace all around the cover ... and lace the flaps in place for pockets. You should use ribbon for felt covers and plastic lacing for the leather or plastic covers. Overlap ends of lacing and tie or sew in place. 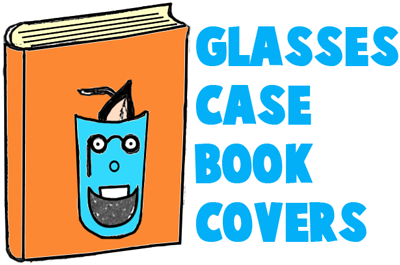 Now you can place the book into your newly crafted cover. You will need about 21 x 9 1/2 inches of felt as well as about 14-inches of ribbon, and yarn. Edge the whole piece of felt with long and short blanket stitches (see instructions here) , using the yarn and a needle with a large eye. Next, fold over 3 inches at each end of the piece of felt so as to make it 15 by 9 1/2 inches and sew the 3-inch edges with a backstitch (see instructions here) , using a regular needle and thread, in places A, B, C, and D, as indicated on the illustration above. These folds will be used to slip in the book binding when the book cover is used. Fold the cover in half to find the middle and at that spot sew on the piece of ribbon, which will be used as a bookmark. Cut the unsewn end of the ribbon on a bias, so it won't shred. a piece of felt 5" X 3" and glue to it two round felt black eyes (or googly eyes). Cut a piece of red felt about 2 1/2" square in the shape of a mouth. Stitch it to the glasses holder around the outside edge of the mouth so that it forms a pocket. Insert a package of glasses polishers and tape these 3-in-I holders to the covers of your most often used books. How to Make a School Book Cover Out of a Decorated Gift Bag- How to cover your child’s book with book cover made from a decorated gift bag. I will detail how I turned a gift bag into a homemade school textbook cover in the tutorial / article below. How to Make a Comics Covered School Book Cover with a Brown Grocery Bag - As my kids get older and older, there seems to be more and more books that we need to cover. I have become a pro at turning brown grocery store bags into neat little school book covers. I decided to turn my son’s Math book cover into a fun comic book cover. I covered the book cover with contact paper to protect the comics. I also put a word search on there, which can be done over and over again since the contact paper can be used as a wipe-able surface for washable markers.